The following text and photos were contributed by a professional photojournalist who, due to anticipated additional travels to the area, wishes to remain anonymous. I remember the day the Berlin Wall fell. I was 17, sitting at home in Northern Germany, watching people on TV hammer away at what had long been a menacing, forbidding symbol of governmental might. It had never occurred to my young self that it was possible that this border, which I had seen on school trips and whose large signs warning of mine fields left a lasting impression on me, might ever be opened. And yet here I was, watching an American singer in a blinking leather jacket bellow his song about freedom. Ever since I moved to China I had wanted an opportunity to see the border between China and North Korea, the only country I can think of about which people speak in similar terms as they did about East Germany in the West. Would it look similar? How was it to live close to the border? What was it like far away from guided tours and the highly publicized DMZ? I decided rent a car and travel north, up the Chinese side of the Yalu River along the border with North Korea. 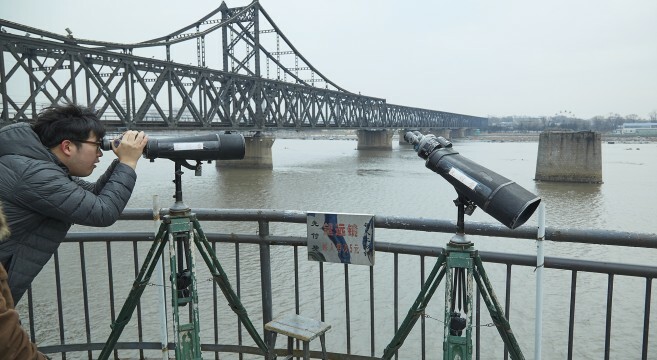 The Sino-Korean Friendship Bridge, a railway bridge connecting Dandong with Sinuiju. 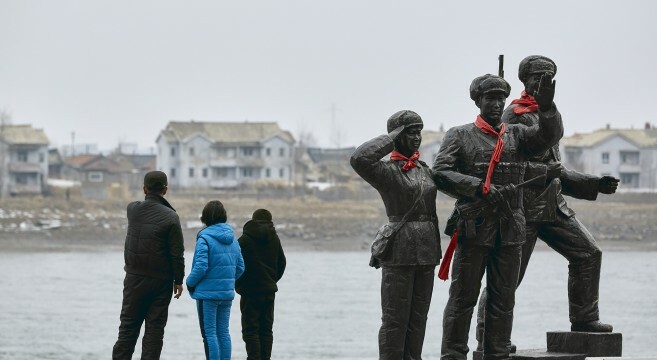 Chinese Tourists in Dandong looking at Sinuiju. 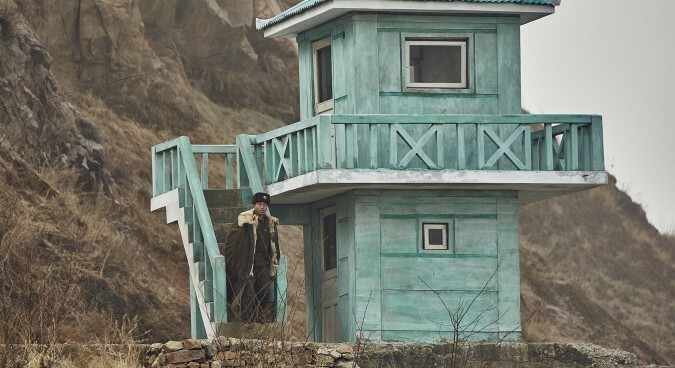 A Chinese national looks to the North Korean side of the border. 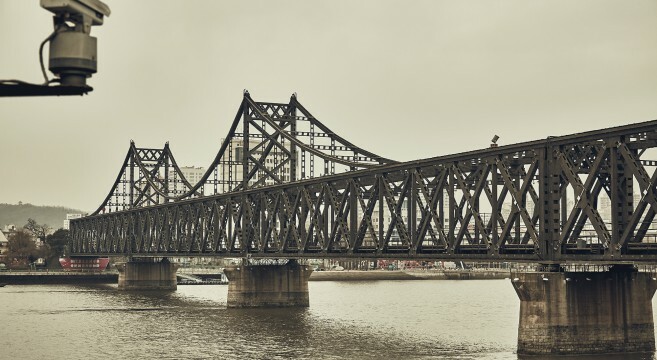 My journey started in Dandong, a city of roughly 2.4 million people that is fairly well-known as the home of the Sino-Korean Friendship Bridge, a well-worn railway bridge that connects China and North Korea. A lone passenger train to Pyongyang travels over the bridge each morning, along with a few cargo trains. I found Dandong, like many prefecture-level cities in China, to be rapidly expanding and popular with tourists, even during the Chinese New Year. Residential high-rise buildings, new hotels and a plethora of upscale villas were being erected. 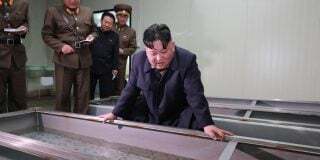 Additionally, a new road bridge connecting the southern part of Dandong with North Korea had recently been finished. That bridge, however, remains closed as road construction on the North Korean side has yet to begin. 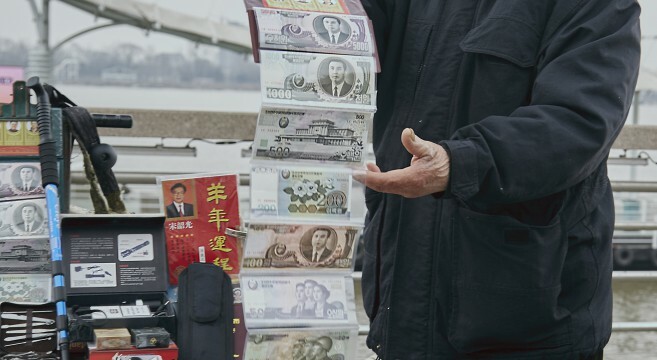 A Chinese man selling North Korean currency as tourist mementos. 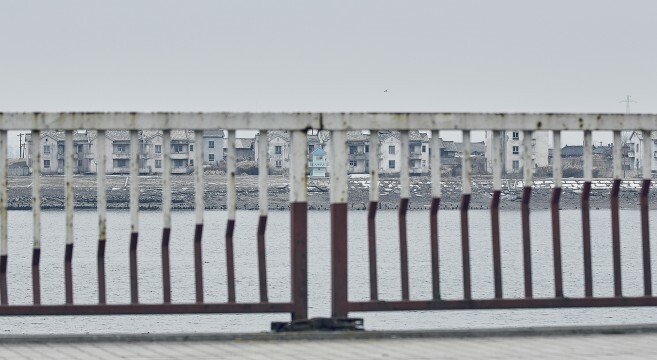 A North Korean guard tower seen from Dandong. 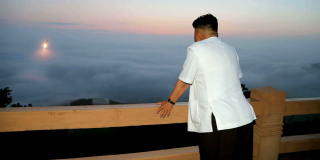 The local economy seemed well-adapted to visitors hoping to get a peek at North Korea. 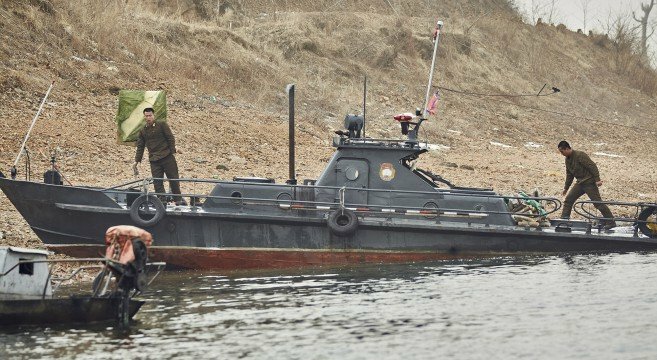 Tour boats travel the Yalu River close to North Korean shores unhindered and outside the city I found it possible to hire small, open speedboats whose owners were offering to take me up to one-hour-deep into North Korean sidearms of the river. Questions as to whether this was dangerous were met with laughter. 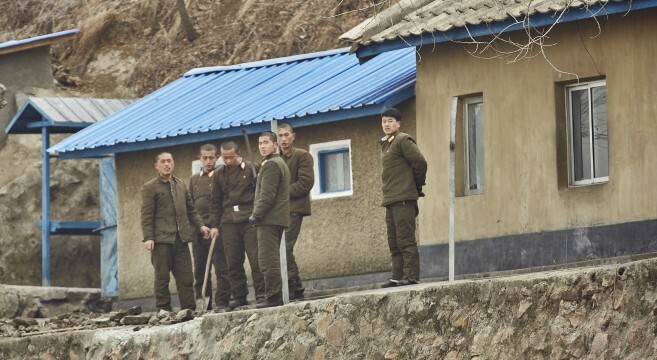 They did this every day, one operator told me, and so I found myself mere minutes later crossing the Yalu approaching North Korean border guards. They, too, seemed well-accustomed to meeting these small speedboats. Péngyǒu, the Chinese word for friend, the driver would scream whenever he saw a guard, pull over to the shore and exchange a few cigarettes or bills. The North Koreans were without exception friendly until they noticed my camera. Even the ones we didn’t approach immediately took aggressive stands, up to pretending to shoot at us whenever a camera was raised. While North Koreans were generally friendly at first, their demeanor changed to openly hostile once they spotted my camera lens. The differences between the Chinese and North Korean sides are immense: Dandong is brightly lit, glitzy and filled with people. Construction equipment and modern cars are everywhere, hospitals and train stations are at the expected Chinese levels. Sinuiju, on the other hand, goes completely dark at night, looks run-down and if you ever do see construction activity it’s going to be manual labor with even basic tools seemingly in short supply. 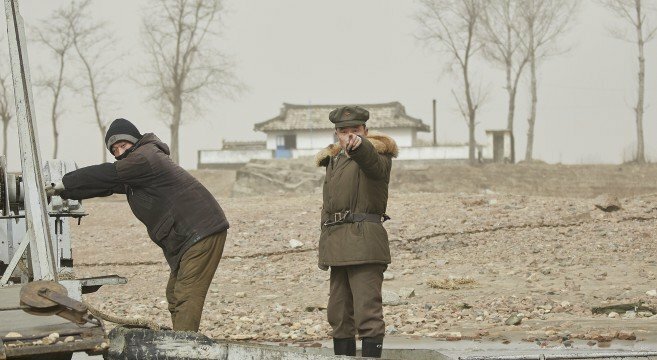 Border guard activities are similarly different: While on the North Korean side a lone soldier with an AK47 can be seen shivering in the cold in regular intervals, the Chinese side instead uses FLIR-like camera systems on large poles to keep an overview of activities along the river. Actual soldiers standing outside are only posted at bridges, of which a few more defunct examples exist as you drive up the river. It had previously been reported that the Chinese side had erected fences along the river to make illegal crossings more difficult but in reality these installations are rare and brief when they do occur. Crossing the Yalu River, much of which is frozen during winter months, seems rather trivial compared to what it must have been like to conquer the Berlin Wall. The Yalu River and a North Korean village, seen from a road near Linjiang. The S319, which runs along the Yalu. I followed the S319, a smooth and well-constructed two-lane road, along the Yalu River North through Liaoning Province towards Jilin. The Yalu snakes itself through steep mountain territory with small villages on either side. 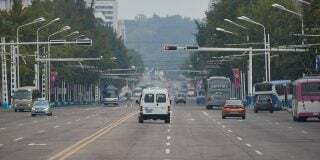 Again the differences were striking: bustling activity on the Chinese side with shops, restaurants, banks and hospitals, uniformly single-floor farm-style housing in North Korea. I never once saw a streetlight. 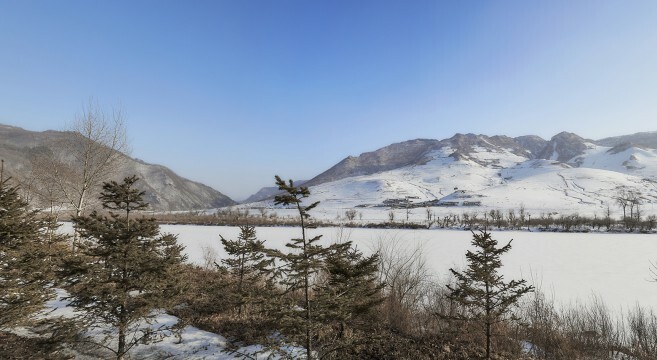 Again border crossings seemed rather easy: North Korean children were walking on the frozen river from one North Korean village to another and one Chinese shop owner immediately told me they’d come over frequently. My impression based on casual conversation was that the local Chinese saw North Koreans who did try to leave as economic refugees who wanted a better life, not political refugees. 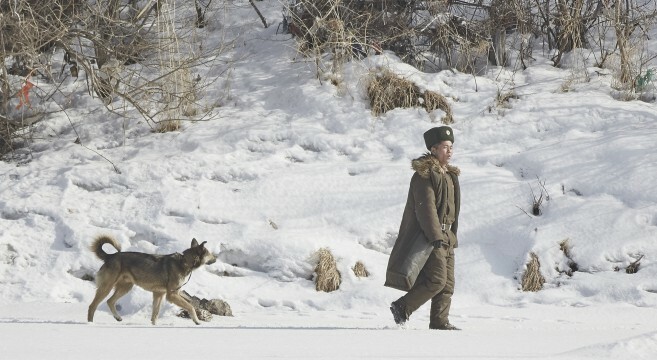 A North Korean soldier patrolling on the frozen Yalu River. 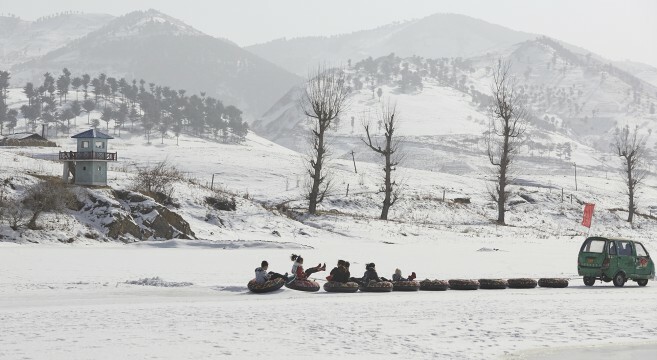 Chinese youth are pulled behind a car on the frozen Yalu River in Linjiang, China. 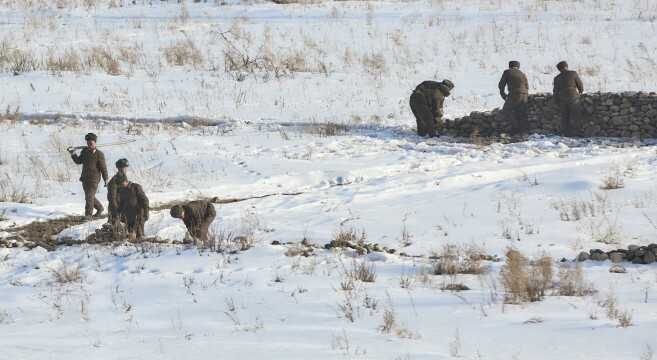 North Korean soldiers erecting stone walls by hand. The further North I got the more the area began to remind me of picturesque Austrian valleys. This may have had something to do with it being Chinese New Year, when the coal-fired steel factories around Baishan or the car industry near Changchun momentarily stop polluting the skies in Northern China. The only thing reminding me that I was in fact looking at a very special place on the other side were the ubiquitous North Korean soldiers. From schlepping rocks by hand to erecting small walls via marching through the freezing cold in tightly organized groups to hiding every few meters on the embankment of the river, they were everywhere. One particularly unfortunate soul had to sit on the embankment of the frozen Yalu river watching the New Years festivities in Linjiang with all its food stalls, amusement rides and frozen river excursions without being able to join in. When the Berlin Wall opened thousands of East Germans streamed into the West to spend the first 100-Deutsche Mark “welcoming money” they were given by the West German government. They chose to purchase items like bananas or Western cigarettes, often hurrying back with shopping bags filled to the brim. I wondered what a North Korean villager would choose first in a similar situation. Subscribe to read the remaining 1244 words of this article.